Apprentices are Spookums that train on an obstacle course in hopes of being appointed as Booster's fourth bodyguard (known as "Snifits"). They are encountered in an area in Booster Pass which could be opened by hitting a switch in Booster Tower. If Mario runs into one, he will battle him. At the end of the obstacle course, Mario can get a few items. In battle, they are adept at using thunder attacks such as Bolt and Static E!. Apprentices are quite weak in battle, and aren't much of a match for Mario. However, if the player is to lose to an Apprentice, what appears to be a typical Game Over will ensue, followed by a short cutscene in which the Apprentice happily declares that it will be named the next Snifit. Mario will then be revived just as he was prior to the battle and can visit Snifit 4 in Booster's Tower (though he does not join the original Snifit trio in their escapades). A new Apprentice will also replace the victorious one, and by losing to him, Mario can repeat the process, promoting the new Snifit as well. This can be done again and again until the fifth Apprentice is lost to. This Apprentice wishes to become Snifit 8, but there is no room for an eighth bodyguard so he is forced to relocate to Grate Guy's Casino, not to be replaced by another Apprentice. 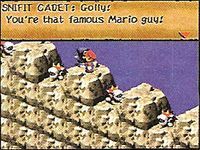 In page 51 of the Player's Guide, there is a screenshot that shows the name "Snifit Cadet" instead of Apprentice, suggesting that the name was changed late in localization. In addition, the blurb refers to the Apprentice as Snifit #4, although he has not been promoted as one of Booster's Snifits. This page was last edited on March 6, 2019, at 10:59.